Up to eight feet of snowfall annually here in Columbia, making it a mecca for winter enthusiasts of all kinds. Columbia's low population density, high elevation, and vast land, make it notably a perfect place for its popular sport of snowmobiling. A vast network of trails spread through Columbia (see image below) and connect with a larger, 6000 plus trail, the network that scatters the New Hampshire State. Many of the trails are regularly groomed and maintained by local organizations, while others are left untamed for the deep snow, powder enthusiast. In a normal year, riders can get 12 to 14 weeks of great snow conditions, the best of which is usually in February. Trails typically open early December and can stay open as late as early April. 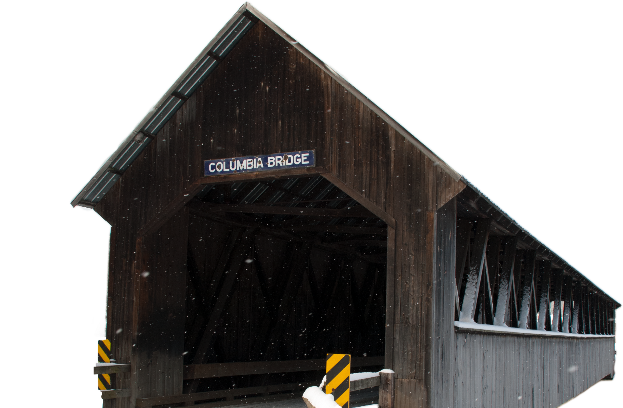 Other winter activities include snowshoeing and cross country skiing, both very fitting on the land of Columbia. The abundance of open trails, frozen waters, and wildlife make it a beautiful place to explore in the cold of winter. Some roads are closed for the season and can make great areas for unmotorized recreation. In addition, many of the snow machine trails are shared with both cross country skiers and snowshoers, so always be aware and make your self visible. Always look for trail markers and signs to see what is permitted on a given trail. - Please keep in mind there is currently no organized trail system dedicated for skiers or snowshoers in Columbia so these activities must be done at your own risk. For snow reports and ski information, click below. The Balsams Wilderness Ski Area & Grand Resort.